Whenever we contemplate planning our vacations, we either opt for a beach romantic feel type of vacation or conquering the mountains. Planning a wildlife safari holiday in India is in itself a very pleasantly unconventional choice. Whether you squeeze in 1 or 2 safaris in your contemporary itinerary or plan an all exclusive wildlife safari holiday, the choice is your’s. But as per our experiences we suggest you to plan an absolutely dedicated wildlife holiday to make the most of your time with your loved ones. 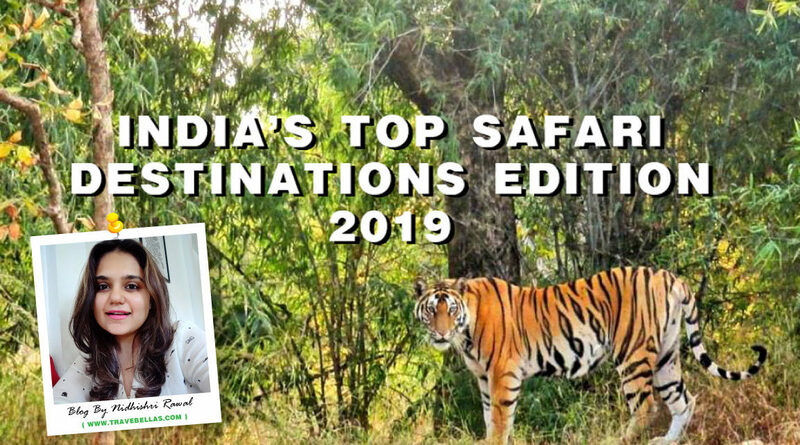 We list down India’s top 8 safari destinations based on our personal visits and the chronology is made on the basis of the chances of spotting the wildlife in it’s most natural form and on the charismatic aura of the safari as a whole. All the safari timings mentioned in this blog post is sourced from the official websites. We suggest you to check the timings as and when you book your safaris. All our safari holiday planning was done by Cenin Travels based in Nagpur, Maharashtra. They are amazing safari planners in India. Among the 8 national parks that we will be listing in this blogpost, Kanha has its own special place in our hearts. We visited the Kanha National Park in the Mid-February when the summers have just begun in India. The forest is so beautiful and welcoming that you will immediately connect to the wildlife and will instantly forget the outside world. Kanha National Park is a tiger reserve and home to the tiger celeb Munna, the most photographed tiger in the world. The oddity of Munna is that the stripes on his forehead spells the letter “CAT”. He is the oldest tiger of Kanha National Park and fondly known as the “King of Kanha”. The nearest station to Kanha National Park is Gondia which is at a distance of about 145 kms and Jabalpur which is at at distance of about 165 kms. The nearest airport to Kanha National Park is Jabalpur which is at a distance of about 160 kms. Jabalpur has the nearest airport and railway which is about 3 hours away. Mandla is the nearest city. Khatia (3 km from Kisli) and Mukki are the two main entry points to the Kanha National Park. From Jabalpur, Kisli is 165 km via Chiraidongri, and Mukki is 203 km via Motinala and Garhi. We visited Tadoba Andhari Tiger Reserve in Mid-February, around the same time when we visited Kanha National Park. Unlike Kanha National Park, Tadoba Andhari Tiger Reserve is relatively dry and barren. As it is located in the central region of Maharashtra state of India, it receives very little rainfall which lets you spot the fauna near and around the water bodies of the Tiger reserve. You can spot deers, sambhars, langurs, blue bulls, tigers with their cubs, etc. It is also a treat to the bird watchers. As this Tiger reserve is not densely forested, the probability of spotting the wildlife increases and the visibility is clear. The nearest station to Tadoba Andhari Tiger Reserve is Chandrapur which is at a distance of about 45 kms. The nearest airport to Tadoba Andhari Tiger Reserve is Nagpur which is at a distance of about 140 kms. The nearest airport to Tadoba is the Nagpur airport which is at a distance of around 140 km. It is well connected to the important places nearby and can be reached by hiring a taxi. Bandhavgarh National Park has a prepossessing terrain which is a combination of meadows, tall grasslands and plateaus that combine together to form a captivating landscape. Bandhavgarh National Park is famous for Bengal Tigers and has the highest number of tigers in India which makes it as a tourist friendly tiger reserve. If you are lucky and patient you can spot leopards and sloth bears apart form the famous Bengal Tiger. The nearest station to Bandhavgarh National Park is Umaria which is at a distance of about 35 kms and Khajurao is at a distance of about 250 kms. Only jeeps are available for transfers. The nearest airport to Bandhavgarh National Park is Khajurao which is at a distance of about 225 kms. This name is derived from the Pench river that divides the tiger reserve into two equal halves, one being in Madhya Pradesh and another being in Maharashtra. We visited the region that falls in the territory of Maharashtra. The famous writers Rudyard Kipling’s book , The Jungle Book is inspired by the forests of Pench. Hence Pench Tiger reserve makes for a prefect backdrop of all our childhood memories making the wildlife safari all the more memorable. The Pench Tiger reserve that falls in the Maharashtra region is not preferred as much as that of Madhya Pradesh region as the wildlife spotting is lesser in the Maharashtra region because it is still in the developing stage. So if you want to spot the wildlife of Pench then plan a trip to Pench Tiger reserve in Madhya Pradesh. Although the beauty of both the regions are unique in their own way. The nearest station to Pench National Park is Nagpur which is at a distance of about 166 kms. The nearest airport to Pench National Park is Nagpur which is at a distance of about 120 kms. Unlike other National Parks of India that can be visited in open gypsys, Nagarhole National Park can best be seen by taking a boat safari. Nagarhole National Park majorly has open and vast grasslands like the Savannahs hence making it perfect to spot the wildlife in their natural habitats. Nagarhole National Park is all about spotting herds of Elephants either through boat safari or vehicle safari. The nearest railway station to Nagarhole National Park is Krishnarajnagar which is at a distance of about 53 kms and Mysore is at a distance of about 64 kms. The nearest airport to Nagarhole National Park is Mysore which is at a distance of about 98 kms and Bangalore airport is at a distance of about 270 kms. We got to know about this not so popular Leopard reserve by watching a documentary on National Geographic. This documentary made us plan a visit to spot leopards in their natural habitat and living in unusual mountain terrains. The hills of Jawai have been formed buy the volcanic eruptions that occurred millions of years ago and these rock shelters have become a perfect abode to the Leopards and hyenas in Rajasthan, India. The unique peculiarity of the Jawai Leopard reserve is that you can easily spot the leopards during the day time and if not adult leopards then don’t feel blue because you will surely be able to spot their cute little cubs running around the hills of Jawai. Leopards are usually shy animals and are not easily potted in dense forested regions or in the day time. But the barren hills of Jawai increases the Leopard spotting to a great extent. The nearest railway station to Jawai Leopard Reserve is Falna which is at a distance of about 21 kms. The nearest airport to Jawai Leopard Reserve is Udaipur which is at a distance of about 132 kms. The safari timings for Jawai Leopard Reserve are very flexible. You can confirm the timings with the hotel you are staying at. Though situated in the dry state of Rajasthan, Ranthambhore National Park is surprisingly thickly forested. We made a visit to the Ranthambore National Park in the early days of the month of February. As winters are still at peak during the month of February in Rajasthan we could not have the desired encounter with the wild lives during our safari at the Ranthambore National Park. The nearest railway station to Ranthambhore National Park is Sawai Madhopur which is at a distance of about 10 kms. The nearest airport to Ranthambhore National Park is Jaipur which is at a distance of about 145 kms. One of the richest and blessed National Parks of India is the Jim Corbett National Park situated in the Nainital district of Uttarakhand. The best time to plan a safari holiday is during the summers as the wildlife is out and about having their abodes near the water bodies. We visited the Jim Corbett National Park in the month of May when summers are at the peak and harshest and the temperatures soaring as high as 40 degrees celsius. During our safari we spotted herds of Elephants, deers, etc. and it is definitely a treat to the bird watchers to spot over 500 different species of birds. Though we planned our safari during the peak season of summer, we were deprived of spotting the Royal Bengal Tiger. The nearest railway station to Jim Corbett National Park is Ramnagar which is at a distance of about 12 kms. The nearest international airport to Jim Corbett National Park is Delhi which is at a distance of about 295 kms. So while planning a safari holiday be very open to all the experiences that you will encounter majorly with respect to the wildlife and their natural behaviour. Even if you do not spot any of the wildlife in your safari, do not get upset for it not being worthwhile decision to visit but on the contrary do enjoy the beautiful and serene surroundings of the forest and make the most of it. Stay tuned for more blogposts in this series and to know our personal experiences on some memorable wildlife safaries we had in India.